An intimate walnut panelled bar. The American Bar features impressive, ornate ceilings and beautiful American walnut wood panelling. The American Bar, with a table set for private dining. The Dining room is through the open doors. The American Bar is an intimate wood-panelled space that is situated between the restaurant and the Ballroom. It can be used in conjunction with either adjacent room or on its own as a private space. 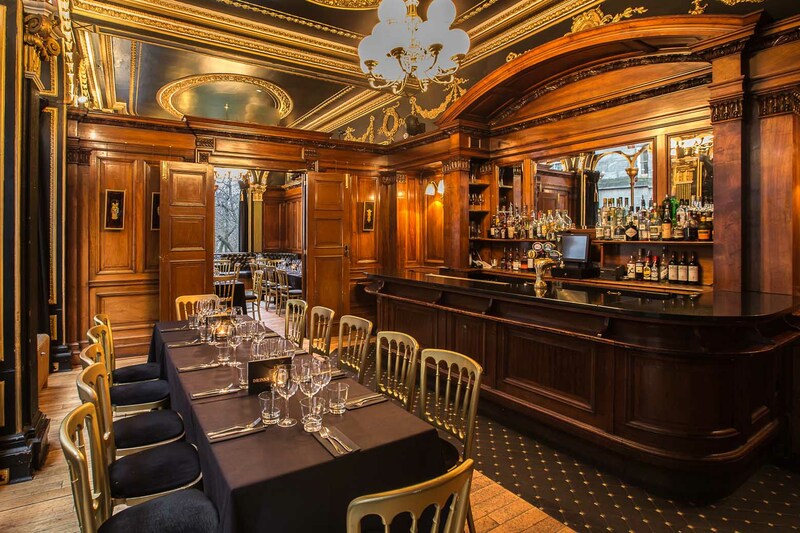 It is often used as a bar for the Ballroom, for cocktail masterclasses or for group dining . Seating and tables are flexible with a beautiful gold lounging couch that is situated for you to admire the ornate woodwork and artwork. Full range of food options available including set menu & canapes.